We live in a loving and caring community. Its spirit shines even more brightly at this time of year. We like to give as much as we can. We invest our time and we invest our dollars, often in food banks. We want to make sure that everyone is well fed during this holiday season. Donating to food banks helps us show our love for others but it will never address hunger. Worse still, it can actually perpetuate hunger by giving us the feeling that we have done our part when we could do so much more. Did you know our region has the highest food insecurity rate in the province? In fact, one in six residents worry about having enough food or going hungry because they do not have enough money. While some people who are food insecure live on social assistance, most receive paid employment. They can't afford healthy food because they work at unstable jobs for low wages. With this type of precarious employment on the rise, more and more working people have to turn to food banks to make ends meet. Charity provides temporary relief for those who receive it. Charity doesn’t change the system and bring justice. System change is needed to build a truly caring, loving community. To change the system and really make a difference, we have to go beyond giving, and take action. A real difference would mean that people could afford to buy their own food and live in safe housing. What would make a difference? Research on food insecurity has shown that basic income, minimum wage increases, and living wages are essential solutions to food and housing insecurity. These changes, however, will not take place on their own. This is why your participation is necessary to create the kinds of changes that will really improve the health and wellbeing of our community in the long-term. 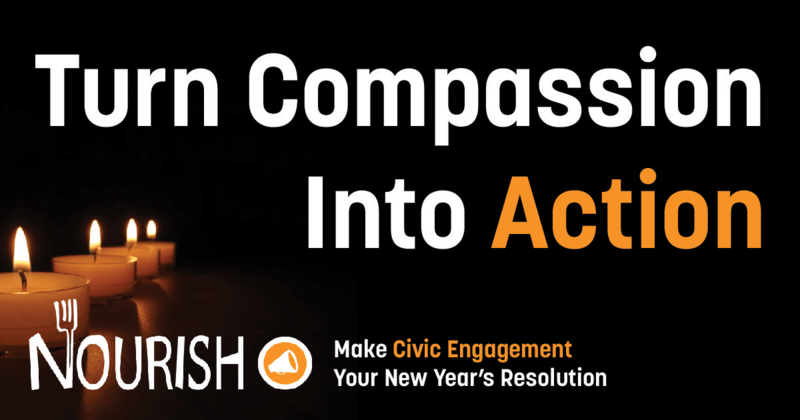 We know it can be hard to find time, but we hope you’ll turn your compassion into action during the holiday season, and beyond! Over the next two weeks, we’ll be sharing plenty of quick ways you can make a difference.